Sasquan Opening Ceremonies. 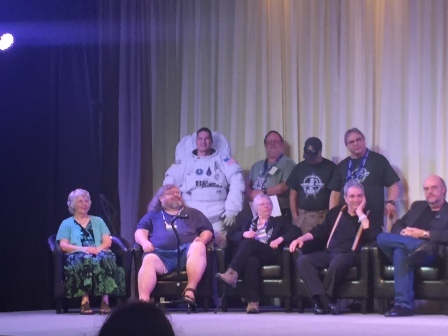 Seated (L-R): Leslie Turek, Tom Smith, Vonda McIntyre, David Gerrold, Brad Foster. Standing (L-R): Kjell Lindgren (photo), Mike Willmoth, Glenn Glazer, Pierre Pettinger. Photo by Michael Donahue, used by permission. 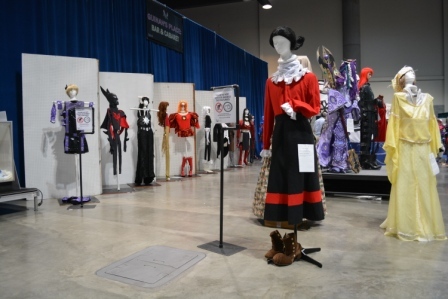 Costume exhibit at Sasquan. Photo by Francis Hamit. S. Usher Evans. Photo by Francis Hamit. 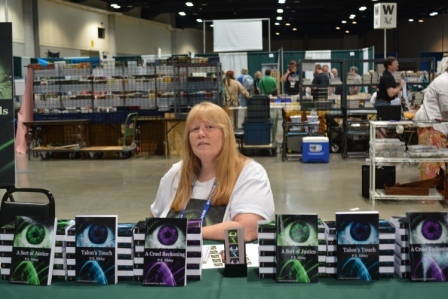 Pat Sibley, attending her first Con. 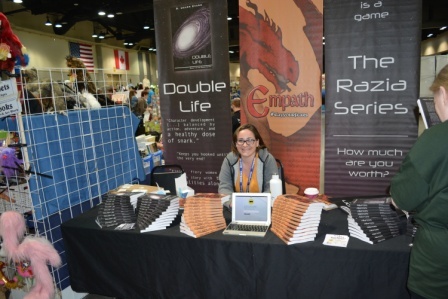 Not just her first WorldCon but her first science fiction convention ever. She is both writer and publisher with the first three books in a series abut Mark Praed, a half-human secret agent with special abilities in the far future. This should be something that any lover of hard SF will enjoy. Photo by Francis Hamit. 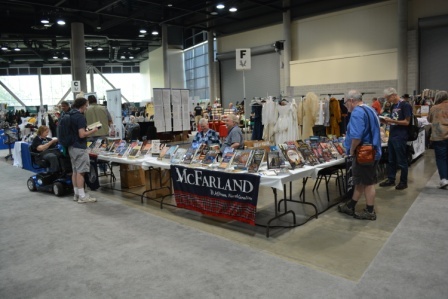 Sasquan dealers room. Photo by Francis Hamit. At the File 770 Meetup in the Saranac. Greg Machlin, event organzier, center, Alexander Case, right. Photo by Francis Hamit,. 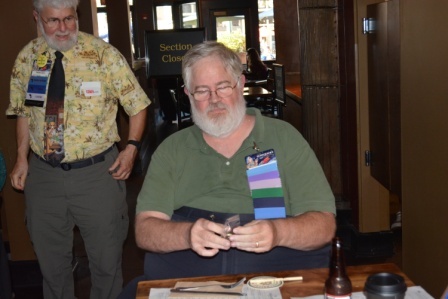 Commemorative button distributed at meetup. Button maker Daniel Dern looks on as Mike Glyer admires his handwork. 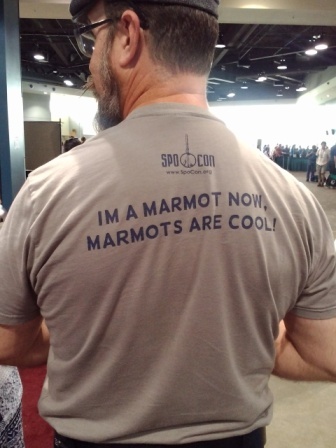 T-shirt seen at Sasquan. Photo by Morris Keesan. 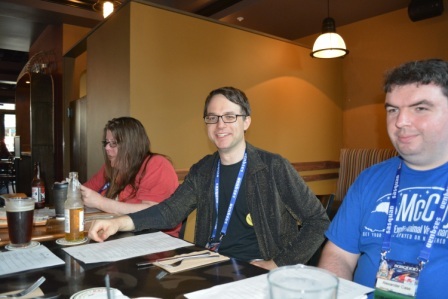 This entry was posted in Worldcon and tagged Daniel Dern, Francis Hamit, Greg Machlin, Michael Donahue, Mike Glyer, Sasquan by Mike Glyer. Bookmark the permalink. Nice pics btw, looks like everyone had a good time. So, alas, not a Tank Marmot joke. All marmot jokes are Marmot jokes. If marmots have a fight club, do they talk about it? The Spokane marmots (not the Tank Marmots) are very cute, and they chirp when begging for food.